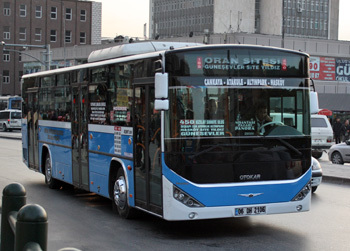 Large cities: Ankara, istambul, Bursa ,..
Turkey is a “bus country”. It is large, distances are long, it has a large population and large cities. Hundreds of long distance coach companies connect the urban centres and cities such as Istanbul and Ankara have very large bus stations. Urban services are equally important with municipal and private bus companies. Smaller private buses, “dolmus” provide services to smaller places and compete with the urban services. In recent years important investements in public transport took place and a dozen cities now have light rail or metro services. Equally important is Turkey’s bus industry. The German bus builders MAN and Mercedes have been established a long time in the country through subsidiaries Otomarsan and Manas but now trade under their own name and have transfered an important part of their bus production for Europe to Turkey. Important players are also TEMSA, which exports large numbers of buses and coaches, and BMC, Güleryüz, Otokar, Karzan and Anadolu Isuzu. A special sector is formed by companies specializing in van conversions, such as Erener and CanCan. minisbuses such as the Mercedes Sprinter, IVECO Daily, Peugeot and Ford Transit are produced locally in large numbers and are used for conversions.